I’ve been eagerly awaiting some posting from my friend the other Laura, who moved to the Mexico City area a few weeks ago to be with her fiance, who I wrote about here. Well, she’s finally written a few essays, and I sincerely hope you will all trek over here for a moment to read about waste and water in Mexico City. Sitting in my air-conditioned office, with five-gallon jugs of Culligan stacked up in the warehouse and barely a spec of trash to be seen anywhere, I am humbled, and I suspect you will be too. About a year ago, when immigration surfaced as an important political issue and Wisconsin Congressman Jim Sensenbrenner’s hard-line anti-immigrant H.R. 4437 bill passed in the House, Fermin and I discussed our future as criminals. Not only would he have become a felon had it become law, but I would have been subject to laws that attempted to criminalize those who knowingly “aid” or “assist” an undocumented immigrant. I foolishly believed that given some time and attention to this issue, the public would sympathize with the plight of undocumented immigrants, and, moreover, recognize their contributions to society and welcome those who desired a more permanent status. I did not predict the fixation on the word ‘illegal,” that it would become mainstream to deride and dehumanize people who are simply repeating the journey of our own ancestors, albeit in a changed world, where laws try to keep people out, rather than bringing the tired and weary in. I also recall Fermin’s sardonic pessimism. He seemed to find the idea of deporting most undocumented workers hilarious, his attitude almost a dare, like go for it, then see how many businesses crumble, how many services break down when the strong backs under the burgeoning service and agriculture industries disintegrate into nothing. I remember being very annoyed with Fermin’s attitude. I thought he was so wrong about Americans. I thought my views would end up being mainstream on the issue. The thing is, just a few years before, I was as clueless as any American with regard to undocumented immigration. I didn’t notice that the people who cleaned the classrooms at UW-Madison were from Guatemala or that the brown men who landscaped the perfect lawns of Brookfield’s office parks were not legal residents, or think twice that on a visit to a Japanese steak house on Madison’s west side, the man skillfully wielding the knives was in fact Mexican, not Japanese. I never noticed, until much later. Now I see the footprints of immigrants all around me. I recall employees who worked for me at Chin’s and Qdoba, some raised the bar for my understanding of hard work, others became dear friends. I notice how the consumer dollar of these immigrants has fortified the economy of the south side of Milwaukee, where yes, there is crime, but also a high concentration of locally owned restaurants and grocers, which draw dollars from all over the metro area. I see their presence in the bumper stickers on cars in Waukesha, West Allis, and West Milwaukee, advertising the city’s first Spanish-language radio station, La Gran-D, which began broadcasting a few years ago. Frankly, I underestimated the influence of racist, nativist thinking. I underestimated the degree to which Americans care about the ethnic make-up of this country. I overestimated Americans’ understanding of migration and global economics, never expecting the naive, ridiculous solution of “sealing the border” would become an acceptable substitute for real immigration reform. And now, despite our personal journey taking an apparently happier turn, it’s hard to feel optimistic about our life in this country. If our future means politics dominated by hawkish national security measures and strict controls that monitor every employee in this country in order to keep “the illegals” out, will we stay? If the deportations increase in frequency with no hope for meaningful reform, will we remain in a partially abandoned city neighborhood? Will my husband, who speaks English with an obvious accent, be frowned upon for the rest of his life? Will people always wonder about him, about us? Is the U.S. turning into the equivalent of a crotchety old-timer, afraid of change and youth, xenophobic, clinging to a cold-war mentality in a post-modern world? Can we not be diplomats? Moderators? Humanitarians? Peacemakers? For more interesting commentary on the proposed bill, check out this link, this link , this link and for a laugh, thanks to the Unapologetic Mexican for pointing out this hilarious Daily Show immigration clip. Trust me, if this whole mess is getting you down, you need to watch this and enjoy a few moments of laughter. I’m not sure if this is amusing or despicable. I’m still here. Things have been pretty interesting the past week and a half. Of course we’re making plans for July, not to mention the future. It’s still hard for me to collect my thoughts on all this, and they don’t make any sense all blurted out (believe me, I tried), so I might be quiet for a while, or maybe not. Besides the ramifications of our approval, there is my deep disappointment with what is being proposed as immigration reform. I’m not sure it’s workable. I’m not sure it’s humane. I’m not sure it goes far enough. I’m not sure it is good for our country. There’s so much, it’s like I’m full. I need to digest, and then I’ll be back. 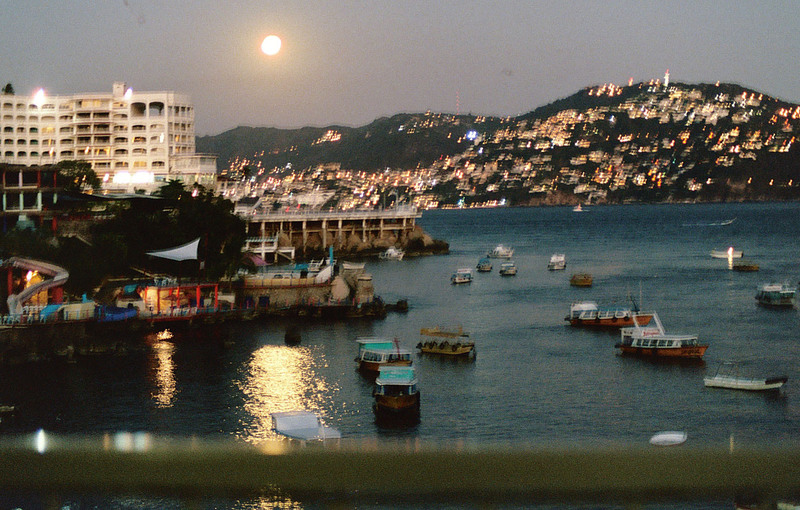 I took this in Acapulco on our last night, but I didn’t get the last roll of film developed until the other day. It’s a new week, and a new design, and apparently, a new life. Friday after work I had some errands to run. Typical stuff: return a movie, pick up a few groceries, stop at the nursery for some more plants. I arrived home before dark, walking from the back of my house where I park my car up front, to survey the progress of the new grass seedlings and grab the mail. As I went inside, shuffling past another and yet another offer to refinance my mortgage, I found a letter from the American Consulate General in Ciudad Juarez, Mexico. Let me state that I was not, under any circumstances, expecting this letter. I’m on several immigration forums daily, at times hourly. I am acquainted with a good number of people going through this process, and not only have there been no approvals from any June, July or August-filed waivers, there have been almost no approvals for nearly a month. This situation has caused a wave of disillusionment and relative unrest on the forums, with many husbands and wives feeling that in the wake of the pilot program, they were being forgotten. Inside the envelope, I found a perplexing letter. I sat on the couch in the living room, and read: “This office is ready to begin final processing of the visa for the applicant name below…” The appointment date is July 10, 2007. My first thought was that they screwed up. They misplaced our I-601, our hardship letter, and any record that Fermin already had his first interview in late August of 2006. They must have scheduled us another first interview, I thought. Great! I took a moment to think about who to call, and quickly decided on my friends Erinn and Laura, both of whom I met on immigration forums. It’s not that Fermin, mom, dad or Sara are not more important in my normal life, but this mysterious letter demanded an explanation, and none of them were going to help me interpret it like Erinn and Laura. Erinn suggested it sounded like an approval. Erinn’s husband, by the way, has been in Mexico three weeks longer than Fermin. Their two children are living with him in his tiny hometown in Veracruz, while she works overtime to keep their bills current. She led me to immigrate2us from another forum, and we later realized we lived about a ten minute drive from one another in Milwaukee. She affirmed what I thought, that sometimes an appointment letter arrives before one is notified that their waiver has actually been approved. If this was true, I assumed that a number of people had appointment letters sitting in their mailboxes at that moment, and that at least one or two of them were posting on immigrate2us right now about their surprising, exciting second appointments. While on the phone with Laura, I logged on to the forum and sadly found no news. I called Fermin, and told him about the weird letter, and that I would call him right back after I called the 900 number on the letterheard for the Consulate. So I spent the best $1.25 per minute ever talking to a very helpful man named Ramiro at the Consulate. Me: So, I received this appointment letter, but I don’t understand why I would receive a letter right now… what does this mean about our waiver? Ramiro: Well, Ms. Bruss (maiden name), your waiver was approved on May 4th. Me: What? What?! WHAT!! (I actually said “What? !” at least 10 times) How is that possible?!! Ramiro: Yes, your waiver has been approved. Me: Our waiver was approved on May 4th? (Then I made him say that about 13 more times, and then I told him he was my favorite person in the whole world, except for my husband). Then I called Fermin back and told him the insanely good but shocking news. He said he won’t believe it until he is back in the U.S., and I said I will definitely not either. Then we hung up and, just to get a second opinion, called the Consulate number again. Me: Ramiro! I thought someone else might answer, this is Laura Bruss again, I’m sorry, but I just cannot quite believe that we have been approved. I mean, I’m on this website for waivers and there are so many people who have been waiting longer than me, how could I get approved… (more senseless babbling) I mean, Ramiro, isn’t it weird that I got approved now? Me: You probably cannot comment on that, can you? Me: So… you don’t have any idea why I would get approved so soon? Ramiro: I’m not really sure why you were approved. Maybe, it’s because there are a lot of people working on waivers right now. Me: Really?! So, do you think there will be a lot of approvals in the next few days? By the way, Fermin already vetoed my plan to name our firstborn Ramiro, but at least he will be ever remembered in cyberspace on an obscure personal blog. So yeah, that all really freaking happened. Two nights later, I’m still just as much in shock as ever, and sadly, none of my cyber-pals have received approval letters. The investigative journalist in me has a difficult time not searching the dark corners of the gift horse’s mouth. I don’t feel particularly worthy of such an unexpectedly early approval, and can’t understand why anyone would have even been dealing with my waiver on May 4th. The Consulate in Ciudad Juarez processes something like 800 waivers of ineligibility every month. Fermin’s interview was in late August, but I didn’t mail our hardship letter with all the documentation for nearly three more weeks. And although the forums I am a part of represent just a small sample of the people actually treading through this process, it seems unusual that we would be approved considering that the few months before have apparently not been touched. In any case, it’s time to stop thinking and start sleeping. Today I was introduced via blogosphere-friend Rich to two other fascinating blogs, para justicia y libertad and the unapologetic Mexican. Between my Journal Sentinel columns, my activity on immigrate2us.net and a number of other circumstances, my little site and I have been inducted into a whole new world of political blogging in the past few months. In October 2004, I started blogging as an outlet for my random thoughts and feelings on life and faith, inspired by my friend Mary. I was a college graduate working in a stressful, physical job, and my writing muscles were in a state of atrophy. My yearning to experience the whole world, it’s people, it’s food, it’s climates and vistas, cultivated by a year spent living in Beijing, re-focused into a complete fascination with the growing Mexican immigrant community right here in my Midwestern hometown. My life was chaotic, as is the case for many 20-somethings, and I was newly married to Fermin, one of those very Mexican immigrants. My musings turned to home ownership, restaurant management-related stress, cross-cultural relationships, and immigration issues that at the time only affected me indirectly. Today, my posts are probably 80% on immigration and other politically related issues. The evolution of this site mirrors my changing inner thoughts and struggles and what I think and care about. Life in my early 20s, when I experienced a crisis of faith and career and wondered where I should live, has shifted in unforeseen ways since Fermin and I, somewhat impulsively, decided to marry. My personal life is much more settled, because I am with the person I want to be with, despite not being physically near him right now, and not knowing where we will reside in a year, or even six months. But issues of faith and religion no longer haunt me the way they once did, I simply think less about them. My life as an evangelical is now distant, and I am just me, the way I am, hopefully a little better than the day before, but probably not. The stress of our immigration problems has hindered my ability to continue the sort of gratuitously introspective thinking I had become accustomed to during college and in the few years following. Relatively mindless activities, like gardening or cooking, once a burden, are now a pleasure. Some days, like a few months ago when I read What is the What, I went to bed in tears, in devastation and disbelief that there are people in the world suffering to such striking, piercing degrees that your mind can hardly wrap around it, and I was laying alone in my house having just dropped $100 at Target on shoes and candles and greeting cards. Now, when I am thinking too much, I start to imagine our future in Mexico — would we live in Puebla, or Xalapa, or Libres? Will I ever be able to pronounce the rolled Spanish “r,” or will I sound like a foreign gringa forever? Will we ever be afford the traveling that I love so much, or will that be a thing of my past life, my jet-setting American life? I didn’t start out blogging to be read, or to change the world. While I love that my readership is way up and that people come here for commentary on the dark corners of the family-based immigration system, I still occasionally need this site as a depository for the stuff that fills my mind. Fascinating article today from a victim and survivor of global outsourcing on Salon. You are currently browsing the one step closer blog archives for May, 2007.